There are not enough superlatives in my vocabulary to communicate how much I love Elyse Marie Vieni's work. The 23 year old Art Institute graduate designs necklaces, bracelets, and earrings that will knock your socks off. Her work is currently carried at two incredibly cool boutiques. Sarca in the Gold Coast and Helen Yi in Bucktown. Elyse studied fashion marketing at the Art Institute, but got her start designing jewelery several years ago almost accidentally. Frustrated by the tacky baubles sold in the boutique she worked in, she told the owner that she knew how to make jewelery (at the time she did not). Frantically she put a little collection together and voila Elyse Marie Vieni Designs was born. Oh, and did I mention she has MAD personal style? She looks like Audrey Hepburn and Madonna's love child in this photo. And can we please talk about these Chanel half-tint sunglasses?! They're killing me. Elyse's earrings and necklace are her own design, and even though the style of the two pieces are completely different, they work together here in harmony. It's one of the interesting thing about her collection that such strong pieces don't just overwhelm the wearer, even on her tiny, tiny frame. She looks beautiful here in these hot pink silk pants and leather vest. Take a look at the photos Amy Creyer of Chicago Streetstyle Scene - A Chicago Street Style Blog took of Elyse outside the Erin Gordon Trunk Show at Sarca. 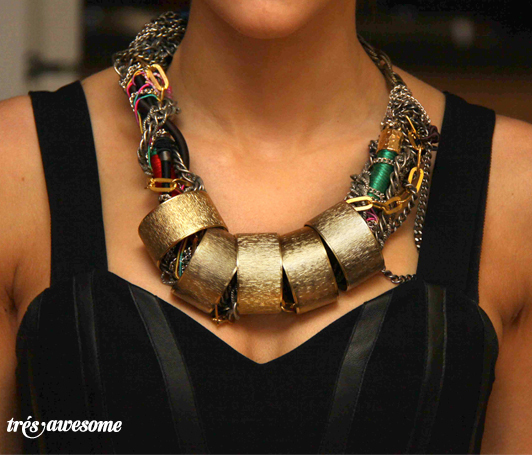 I have never seen anything like this necklace. It's a brilliant design and looks amazing with the pink pants and leather. I am a huge sucker for Native American style beading, so this necklace (entitled Indian Princess) is right up my alley. I also love all the chunky piles of chain metal that are interspersed between the beading. Ok, so this is the point where I say to myself, Elyse Marie Vieni rules the world. 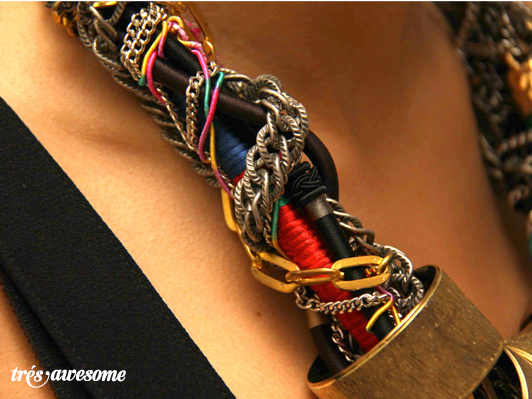 I love this haphazard collection of metal and wrapped string wires. It's very 80's I.B Diffusion. Ta da! I bet you didn't think things could go uphill after the last 4 great necklaces, but here we are. This one is SPECTACULAR. It looks like it's built into her dress. The good news is Elyse is throwing a jewelery party this weekend on Saturday, March 26 from 6:00pm - 10:00pm in Bucktown at 2046 W Charleston 2F, Chicago, IL 60647. The even better news it that she'll be selling ALL HER WORK AT WHOLESALE PRICES (that's 50% off)!!!! I'm gonna be honest with you when I say her work isn't cheap, but it's definitely affordable as a splurge at wholesale. So run, do not walk this Saturday to the party in Bucktown. If for nothing else than to see the work in person, it's truly extraordinary. Oh gosh, that Indian Princess necklace makes me want to DIE with happiness. I must go check out those boutiques, and see if I can come to this jewelry party! These are great photos of a wonderful Chicago designer. Her pieces are AMAZING, and I must say the Indian Princess is my favorite. I love detailed beadwork like that. This is a great feature. I've never heard of this designer, so it's great to get all this info! Love that last necklace. These few pieces are just a glimpse of her amazing collection. I've seen multiple other pieces of hers and they are even better in person. Don't pass up the chance to attend one of her parties...trust me, you won't regret it! I enjoy your enthusiasm for these, but don't you think big clunky jewelry is well on it's way out? Statement jewelry should be real big Elizabeth Taylor stuff. Rocks on a rope just isn't interesting anymore. Enthusiastic, who me?! 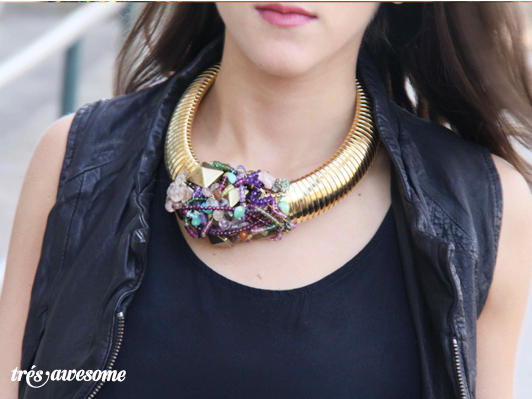 :) I think big statement jewelery will always be in. I guess it just comes down to what floats your boat. amazing style. very chic yet eccentric. she looks like a modern day audrey hepburn with a twist.